I contacted Jeff at Custom Chainmail (because some posters here referred me to him and he did a great job on my hauberk) and he told me that he works with 2 distinct styles of chausses...stocking or laced. The stocking version is exactly that, a tube that your leg fits into. It has a giant loop by the waist area that allows it to be attached to a belt so the weight is dispersed around the hips. The laced version, which he specifies is probably more historically accurate, is open in the back and is cinched with leather cord. When confronted by something like this I tend to lean on the side of historical accuracy. Can an argument be made for either style over the other? The laced version, while being deemed more accurate, seems more prone to failure in the field as a good hit can slice the lacing and render the maille on that leg virtually useless. And the last question...boots. Should I wear the boots over the maille leggings, or should i allow the maille leggings to drape over the top of the boots? Decisions, decisions! Thanks for any information or suggestions that you may have, I greatly appreciate it! I put my own late 13th century kit together a LONG time ago, so I don't necessarily trust my memory of the research I did. But as I recall, lace-up chausses are only good through the 12th century, and by late 13th you definitely want the tubular type. Mine have feet, though the soles are leather, laced onto the edges of the mail (no mail on the sole, in other words!). So I don't wear shoes with them. And it should be *shoes*, no more than an inch or so above ankle-height, not really "boots" of any sort. My mail predates "Made in India", so it's all butted, bailing wire and coat hangers. Try to imagine it as riveted... Also, I went with separate mitts, instead of building them onto the sleeves like I should have, but my excuse is that I use the hauberk for Hastings era as well. Does that get you started? Have fun! Historically, your choice is not an 'either-or', but a 'neither'. There is simply no evidence for padded hose beneath the mail chausses. Yep. What he said. They certainly aren't needed from a practical standpoint if the mail is tailored properly. Mart Shearer: I went back through some old posts on here via the search feature and did find a few pieces of information regarding maille leggings. I believe there was one topic where a poster mentioned a medieval manuscript detailing the fact that maille was worn over regular hose. It seems that it was possible to circumvent the padded/gamboised under-material. Supposedly, there was not as large of a need for leg protection as the hauberk was tailored to be quite long, reaching mid thigh. 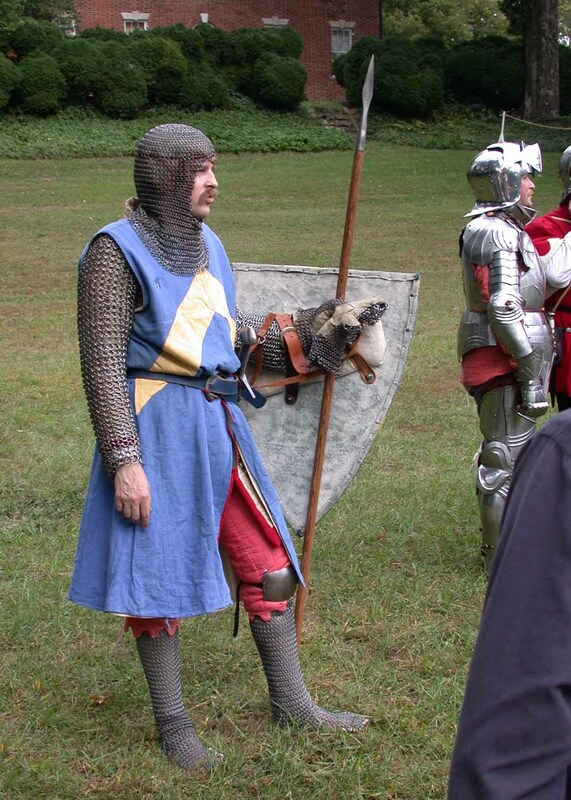 The length of the maille shirt would, in fact, require less emphasis on leg protection. If I chose to forgo this part of 'historical accuracy' and wanted to wear the padded chausses anyway, would that be such a bad thing? I understand the comment Dan Howard made about the issue being invalid if the maille was tailored to me specifically, but these pieces are going to be made by someone across the state with only my measurements to guide them. I should also mention that I am a big dude but I have been losing weight recently due to exercise, so my measurements may change over time. If I go with the Armstreet arming pants (which look to be much thinner than Stahlgilde) and use the laced style maille leggings, I can effectively 'draw in' the maille around my leg which is kinda close to having it tailored. This will also allow for future adjustment if my legs get smaller or GASP, larger cause I gained weight back for some reason. 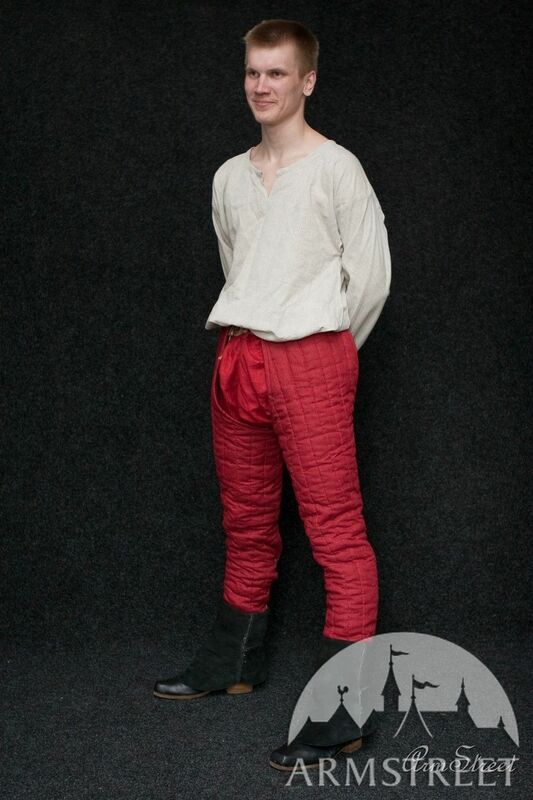 See how he is wearing boots and the top of the boots cover the maille leggings? Is it possible that anybody could provide a link to a post with some images of shoes/boots and how the maille interacts with them? Thanks for all the replies and sorry for being a pain! I can see that you might want padding if you were doing some sort of competitive combat, with wood or steel weapons--is that the case? If not, all you're doing is adding bulk and retaining heat. My chausses are tailored somewhat, but below the knee they simply gather in by their own weight, as mail does--they can't really be smaller since my foot has to go through. Laced-on chausses will fit better without padding, too. The figurine is nice inspiration, but the boots and gloves are not accurate. If you Google up things like the Maciejowski Bible (everyone's favorite late 13th century pictoral source! ), you'll see no shoes worn with chausses, as far as I know. The shoes are never higher than the ankle. The only man wearing gloves is hawking, as I recall. But there are plenty of other illustrations from the era, as well as archeology and literary evidence. My advice: If you want to do something historical, don't let fantasy elements creep in! It's a pretty well-documented era, so you shouldn't have to do much deep research to nail all the basics. If you want images that you can be certain are authentic, search Manuscript Miniatures: http://manuscriptminiatures.com/search/ Any other forms of artwork, including resources like Osprey Books, are of dubious accuracy. Go straight to the primary visual sources, and stick with them. Do we know for certain that hose worn under mail chausses were definitely not lightly padded? As has recently been discussed, we see images of mail shirts worn over regular tunics. Do we have similar images of men putting on mail chausses over regular hose? We don't tend to be shown aketons under mail until the 14th century, even though we have written accounts for aketons under mail as far back as the 12th century. Why is this? Perhaps this is because of a shift is artistic style, a move closer to more realistic depictions of armour? What does the literature say about this? Do we have written accounts describing mail chausses over regular hose? The King's Mirror does use the same descriptive terms (soft and thoroughly blackened) for the hose as it does for the gambeson. What do you guys make of this? Try to do a search on "panzerhose." There are a couple of old threads with pictures that may show you the internal construction of mail(ed) hose and whether they had integral padding or not. From what I remember reading, panzerhose were hose lined with small rectangular plates. If this is correct then they would be worn instead of other leg armour, and not underneath it. I am thinking that panzerhose and gamboised cuisses are the same thing. Wow, so many replies! Time for me to start answering some questions here!!! Matthew Amt: I am going to look into the Maciejowski Bible and see what kind of images I can come up with. At this point, I am willing to look into any and all resources to make sure that my decisions on leg armor have some kind of historical base. Craig Peters: Thanks for the link. Later on this evening, after I am done with my run, I will have a gander at the manuscript miniature site that you posted so I can see what kind of pictures I can dig up. Jason O C: I would tend to agree with your reason here as well. I would have assumed (and we all know what happens when you assume) that the same rule for padding under maille would have applied to the legs as well. It is quite the dilemma. Layfayette C Curtis: I did a search here and on Google for panzerhose. This may just be my ignorance talking, or perhaps my inexperience with armor in general, but the panzerhose seem to me to be a relatively thin layer of material with some sort of patch maille sewn on to it? The images were from the 14th and 15th century, so perhaps this armor was designed more as a supplement for plate armor, i.e. greaves? It appears that the maille sections are located in front of, or maybe behind the kneecap area, which doesn't make sense because shouldn't poleyns normally do that job? Mark Moore: To answer your question, no combat. I am assembling this set so that I can go to a Ren Fest or dress up for Halloween or a costume party. While I am concerned with trying to make something historically accurate, my main goal is to make sure that it doesn't look fake, or like a rented costume. I want someone to see me and be like "Damn, that must be what a Knight Templar looked like back in the day". So, yes I do have a hard time trying to balance out the 'everything must be authentic down to the leather laces' with the 'this sword belt looks so badass that I can't not wear it'. Hi Paul. As far as I know the prevailing thought at the moment is that mail chausses were worn over normal everyday wool or linen hoes. If you are not going to be fighting and getting hit in the legs, then there's no need to wear a garment which at this time is still only hypothetical. If you want to have a historically accurate kit, but still dip your toe in the realm of fantasy from time to time, you could buy accurate hoes and mail chausses, and wear them with either; historically accurate shoes, or fantasy boots, depending on you mood on the day. Jason. I can't think of any image showing what kind of hoes were worn under a pair of mail chausses. Even if such an image exists and it shows that the hoes were plain and unquilted, this wouldn't prove that padded chausses didn't exist, no more than the Maciejowski Bible proves that aketons didn't exist. Not that I think padded chausses existed. I mean they might have, but who knows. As for literary evidence. I go into detail about the King's Mirror on the thread that Matthew Amt linked, so I won't repeat myself here. That thread also has a post from Mart Shearer, where he quotes from Diu Crône an early 13th century text. Diu Crône has a section describing men arming from a tournament. It lists the equipment worn, including the arming garments worn under the mail. It mentions gambeson, collar, and coif (I presume, given the early date, a padded arming cap is intended, and not a mail coif). Note that there is no mention of hoes, this is probably because there was nothing special about them. Again we have to ask would padded arming chausses have been necessary? As most of the weight of a mail shirt hung from the shoulders, one of the key functions of arming garments for the torso was to lightly pad the shoulder area thus making the mail more comfortable to wear. As mail chausses were suspended from the hips, I don't think that padding would really be practical or even necessary. When you search Manuscript Miniatures, do not become solely focused on looking for images of Templars (or Hospitallers or Teutonic Knights, for that matter). The reality is that we have relatively few manuscript images specifically depicting the crusading orders. Instead, be willing to look at general images of knights and soldiers from the time period you're interested in. What sort of helmets do they have? What about their shields? Scabbard style and suspensions, and belts? Footwear? All of these details are pertinent. You might also look at the rules regarding Templar dress and accouterments. Padded hose you can buy from various shops will be too thick and rigid to wear comfortably under mail chausses. If you want, you can make your wool or linen hose with two layers. That will provide one additional layer for a bit of padding. No need for anything more. If you did fighting, I would have recommended Matthew's style from the picture, padded cuisses with plate cup for the knee.